Here is a short video showing how this frame can be used! 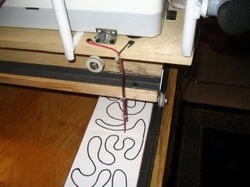 It cost $163 to build the complete 12 foot machine quilting frame in 2007. The cost of materials may have increased some what since then but not much. We have additionally added the front handles to these plans but they don't cost much to build. This frame will work with pretty much any machine as long as you can drop, cover or remove the feed dogs and install a free motion or darning foot. The only draw back to normal home sewing machines is the throat size. Typically they are about 7 inches from the needle to the back of the throat. They can be used just fine but as the "quilt sandwich" gets wrapped around the fabric pole in the throat of the machine it starts to limit the quilting area quite a bit half way through your project. The work around for that situation is to stop when your half way and turn the quilt 180 degrees or end for end and then quilt from the center out. The 9 inch machines such as the Janome 1600P or Juki 98 quilting machines are of course a better choice. My wife Kathy and I made quite a few quilts with a small 7 inch Japanese Singer clone we purchased at Goodwill for $7.50 and we had fun. It was also real good practice. "Kathy's Quilts"
Some of the pictures in this you tube presentation shows us using a small green Kenmore machine. Did I see you offering larger carriage parts on Ebay for your quilting frame? If I did, are plans available for that bigger carriage? Also did you have to change the size of any of the rest of the frame when you used the bigger carriage? I am looking to purchase a machine with a larger throat area of about 16" so I was curious if I was going to have to modify my awesome frame that my Dad built from your plans. Any input you could give would be greatly appreciated. I love my frame but hate how limited I am to quilting only 4" at a time. Good morning. I have been reading your website and am very interested in your frame plans. Being new to machine frames, in fact I have never even seen one in person, I was wondering if your plan includes adding either a laser pattern reader or the stylus with the plastic patterns. I looked throughout your website and see nothing mentioned about pattern transfer. I have done quite a bit of woodworking an believe this frame is within my skill level. If you can answer this question for me I would greatly appreciate it. My husband made this frame and I am purchasing a SURE STITCH REGULATOR for it, I was wondering what Grace frame matches your plans the best, this is one of the questions I'm asked before I can make the purchase for the regulator. Our frame does not match the the grace frame but the carriage rolls on rails like the grace frame and the encoders have wheels like the frame your building so you will have to simply mount there encoders on the upper and lower carriages so they roll on the rails. One approach to this may be to drill a third hole in the rail that holds the carriage wheels then mount the encoder between the existing wheels instead of trying to replace one of the wheels with the encoder.